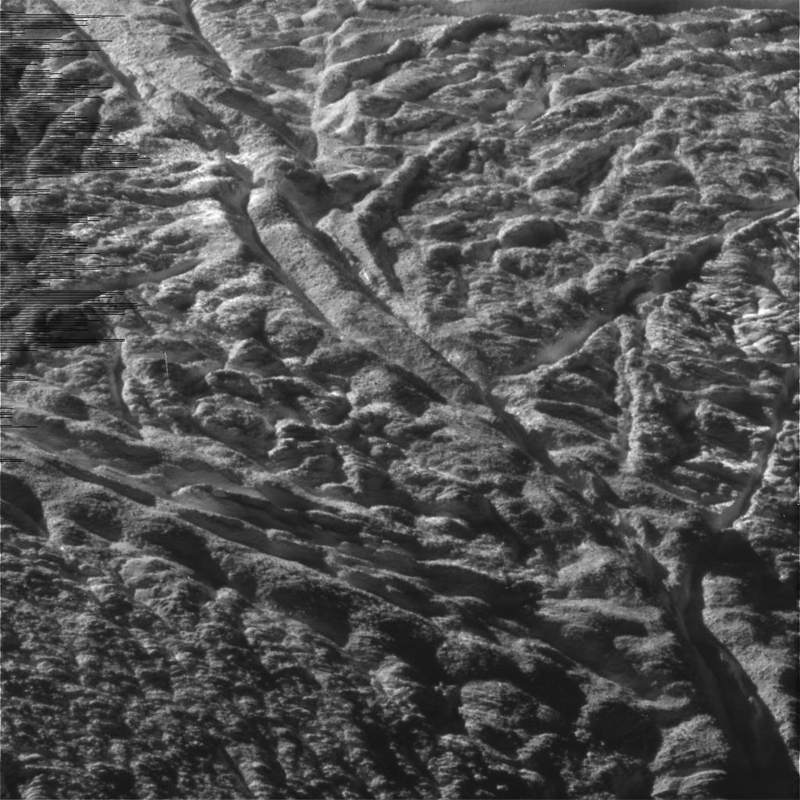 Enceladus, Saturn’s 318-mile-wide moon that’s become famous for its ice-spraying southern jets, is on astronomers’ short list of places in our own solar system where extraterrestrial life could be hiding — and NASA’s Cassini spacecraft is in just the right place to try and sniff it out. On March 27, Cassini came within 46 miles (74 km) of Enceladus’ south pole, the region where the moon’s many active water-ice jets originate from. This was Cassini’s closest pass yet over the southern pole, allowing the spacecraft to use its ion and neutral mass spectrometer — as well as its plasma spectrometer, recently returned to service — to taste the icy spray emanating from deep fissures called “tiger stripes” that scar Enceladus’ surface. In addition to water, salt and organics, there is also a surprising amount of heat — heat generated in part by tidal friction, helping keep Enceladus’ underground water reserves liquid. “If you add up all the heat, 16 gigawatts of thermal energy are coming out of those cracks,” Porco said. This creates, in effect, a so-called “Goldilocks zone” of potential habitability orbiting around Saturn… a zone that Cassini has easy access to. Cassini’s latest results — and images! — from the flyby should be landing on Earth any time now. Stay tuned to Universe Today for more updates on Cassini and Enceladus. Read more on NASA Science News here. UPDATE: For images from Cassini’s flyby, showing closeups of Enceladus as well as Dione and Janus, check out the CICLOPS team page here. Enceladus appears to be an interesting alternative for the search for life than Europa. It spews internal material into space, so there would be no ‘immediate need’ to land, drill down to a sub-surface ocean, and deploy an autonomous submarine to investigate. A relatively slow moving Enceladus orbiter could collect fresh geyser particles and examine in-situ for any signs of life. A more ambitious mission, with an aerogel wafer similar to Star Dust, could fly through the ice-jets, collect samples, and return to Earth. Budget allowing, however. It’s that “return to Earth” part that makes me hesitate. Visions of ‘War of the Worlds’ are the reason. I think it is more like “The Andromeda Strain.” If we do return samples from Enceladus they will have to be absolutely quarantined and sent back in a return capsule that can’t rupture. If there are organisms inside Enceladus their release into our environment could pose unexpected consequences. And then, the return craft itself will have passed through the plume, so the exterior of the craft could also be contaminated. I think instead, we should use a robotic lab to capture and test samples, then drop into Saturn. I hate to sound paranoid, but…. Some times there is just no substitute for human hands. Why not, instead of returning the samples to earth, we could do all our testing on the ISS? Worst case, the station and all it’s crew have to be quarantined, way better than a pandemic. I would agree mostly, but I think ‘worst case’ would be a dead crew and ISS unusable. And even with that in mind, there would most likely be no shortage of eager volunteers willing to participate in possibly the greatest discovery in all of human existence. You are right. I would even consider it myself. A return craft could be captured and docked to an external laboratory on the station. I too have written about something of this sort. A Saturn probe could be sent in the future which has multiple functions. There could be a core spacecraft that is a smaller version of Cassini, with three small craft that detach. One part passes through Encladus’ geysers and continues on its orbit back to Earth. A second part with the RGU is inserted into a low orbit around Saturn. This part has a Gravity-B type of gyroscope system to test for Lense-Thirring frame dragging in a bigger gravity field. It could also have sensors for observing the atmosphere up close. A third part lands on Titan, with maybe a balloon or similar craft for exploration. The Jovian moons still have opportunities similar to this. Europa might have geyses that send material into space. The moon is much bigger with larger gravity, so it might not send material into space. However, it might lie on the surface. A rover on Europa might then be able to collect this material and makes in situ tests. However, I agree that we are not going to send a large robotic drilling operation there. However, I agree that we are not going to send a large robotic drilling operation there. The most feasible sample return mission, indeed, could be a single flyby through the plumes before swinging around Saturn for a gravity assist back to Earth orbit. Carrying a considerable amount of fuel to enter orbit and departure would be unnecessary. Unfortunately, it would be a very fast flyby, so I read from a study; one that would vaporize any organics upon aerogell impact. So a decade years later, when opening the canister, all we may see are hollow craters and clean tubes. So we are left with a few options. We could slow down enough to orbit Enceladus with an on-board laboratory. Any unfortunate microbes being ejected (hopefully) could be captured in aerogell with little damage, and examined. IF anything interesting does appear under the microscope, then it may justify a high Delta-V sample return mission. That said, this will be decades into the future, taking decades to complete. Your statement here is similar to what I would propose initially. The spacecraft would have a capsule that separates from the rest of the spacecraft. The capsule makes only a minimal delta-vee adjustment through the Saturnian system. This capsule opens up and presents aerogels to the geyser plumes, and then after the flyby it closes up. Ideally the orbit would be a near Hohman transfer orbit which connects or kisses the orbit of Earth and Saturn, so its return flight would require near zero delta-vee adjustment. Depending on the anomaly angle or time of the mission there of course might realistically be some course adjustment or gravity assistance from Jupiter or other planets to bring it back to Earth. I would be dumbfounded if there were no microbes in the spray and these and more complex life forms in the waters of Enceladus, given the Goldilocks conditions for life there, after the 4.5-billion-year existence of our shared solar system. To my self-critical, common-sense cognitive instincts and citizen-scientific rational mind, indigenous life is present, with certainty, in the waters and water beds of Enceladus. Let us examine it with caution and utter respect as well as honor wholly it independence and liberty permanently. If we do not desist with our historically rivalrous and clashing, often mutual, supremacist crusades and campaigns, they will eventuate in us in meeting our match not only on Earth but possibly unexpectedly extraterrestrially, to our complete destruction or complete and abject, squalid and unmerciful subjugation. I conjecture that there is also a diversity of both plant and animal aquatic life on Jupiter’s moon Europa approximating life as we know it on Earth and, to our minds, the most bizarre and alien kind/s of life on Saturn’s moon Titan. Too little is known about abiogenesis to give life on Europa or Enceladus (or Mars for that matter) any probability… so I prefer to treat it like Russel’s Teapot – until there’s evidence of it, it doesn’t exist. The sum of all of the considerable scientific research from the investigation of the incidence and distribution of life on Earth has conclusively determined unanimously that life occurs in virtually any and every environment with the very least conditions to support its existence, including at fiery thermal vents in the oceans, in no-light marine and subterranean locations, in the harshest (even chemically) and most desolate hot and cold deserts and low-oxygen mountain elevations, ad infinitum. That is, the overall finding is that life is tremendously (indeed, incredibly) hardy and adaptive and fills and occupies, in some form, any environment, however generally inhospitable to life, in which it can survive or to which it can adapt and survive. Logically, the compelling extrapolation from this scientific knowledge — the facts — is that where the conditions conducive to or supportive of the vast diversity of life as we know it on Earth exist on other celestial bodies beyond our planet, life as we know will most probably be present under those conditions or the minimally adequate least of them, favorable to the existence of life, regardless of our current insufficient knowledge of the biogenic minutia accounting for the origin of life. The latter will come. Now that I have declared the scientific basis of my wagering (confident) hypothesis, it remains to be tested. I assure you that this is not exclusively my hypothesis and that NASA and many in the science community share it and are most eager, or frenzy, to explore, data collect on and test it. Given the stingy budget imposed on NASA for timely and aggressive space exploration — in this case, follow-up exploration — NASA should consider R&D for low-expense, mini spacecraft (maybe all-frills laptop size, if feasible) that can double as in-situ satellite submarines and hover craft, in the case of Enceladus, to scientific data collect and video take and transmit findings data and video steam continuously back to NASA, ESA & JAXA, etc., long term. It’s time to get back to my picnic. It’s certainly true that life on earth exists in a very wide variety of environments, and I’m sure some of the environments (if not many of them) exist on other worlds, including those in our own system. But life can only exist in a place after first coming into existence, and the environmental conditions for that are currently not well understood. Life exists on Earth in frigid conditions but most scientists will agree that it never originated in them. A delicious piece of agar jelly in an oxygen-filled jar would be very conducive to life, but unless it’s conducive to abiogenesis it will sit there, uninhabited, for the lifetime of the universe. Other worlds could be similar. Europa might be a great place for microbes, full of uneaten minerals and unbreathed gases, but unless Europa once had the environmental conditions necessary for microbes to come into existence, it’ll be lifeless. We simply don’t know what the necessary conditions for abiogenesis are, and whether those worlds ever had them. Conceptually your conclusion is right, but empirically, when we test for the presence of life in “natural” habitats compatible with life as we know it, like we can easily and probably will do with Enceladus, it may turn out that, as it has so far, wherever we check for life in natural environments that are supportive of or conducive to life, it is always, or generally, the case that life is present in those natural environments in some form. We know one important thing about the etiology or genesis of everything, including the quantum particle microcosmos, celestial nebulae, stars, planets, solar systems, black holes, galaxies, biology and the macrocosm (the universe): they are the products of evolution (inclusive of mutation and reconfiguration), basically via energy and matter, space-time, the forces of thermal dynamics, particle physics and chemistry (chemical interactions and reactions). As I understand it, life is geology that has evolved from a combination of inorganic and organic molecules (and organic compounds?) into further evolving self-replicating yet evolving animate matter, such as life-foundational DNA and proteins. The big questions about the occurrence of life are: 1. How does it transition into itself from the inert or inanimate, given life-hosting conditions? 2. Is its distribution in the universe a result of as yet not sufficiently scientifically understood common physical mechanisms and processes giving rise to life forms of localized origin or is it a result of panspermia and the seeding of life-compatible worlds by the impacts of external life-carrying space debris and objects, or a combination of these? Dr. Craig Venter, who has created the first synthetic microorganisms, may be along the way toward shedding some brighter light on our questions. Based on all available evidence, a “self-critical, common-sense, cognitive instincts and citizen-scientific rational mind” does not come out with statements like “indigenous life is present, with certainty” nor does it come out with odd ramblings about liberty and squalid subjugation. Sorry brother, but you’re a couple sandwiches short of a picnic. We will have science with a moral compass or science without a moral compass and the resulting social, political and environmental impacts of whichever we chose between these two options. Science and scientists are not above moral consciousness and conscience, as there have been psychopathy and grievous irresponsibility in science and among scientists and perpetrated by these in the past to date. Rather moral consciousness and conscience must be an ever-present integral part of science work and the work of scientists and engineers. They contribute significantly to all-around, universal good human relations and diplomacy as well as such harmony. Physics greats Niels Bohr, Albert Einstein and Robert Oppenheimer spoke out on the necessity of moral consciousness and conscience in science and the great harm of their absence from science. The psychologist Kenneth B. Clark wrote an essay counseling scientists to introspect fully their otherwise unexamined personal, or shadowy, motives and objectives for their research and science so as to avoid unwittingly, where applicable, biasing or misapplying their science work. Of course, there are cognitively gifted and highly educated individuals who couldn’t give a damn about (but even scorn) moral consciousness and conscience in science and bellow that they have no place in science thinking and work, and hold them irrelevant as regards other people or social outsiders, like the A-bomb and H-bomb physicist and enthusiast Edward Teller, Nazi rocket designer and engineer Wernher von Braun and Nazi medical researcher Josef Mengele, M.D. Thanks for the diatribe E4. Well repeated. Elevator keeps getting stuck at the 8th floor eh? So .. IF … there are microbes on/in Enceladus, they would have had spaceflight eons ago? Yeah, instead of spectroscopy or chemical analysis, I want to see some of this water under a dam microscope! Let’s see these bugs for what they are and finally, we’ll know what aliens really look like…if indeed, there are any at all. unintelligent single celled life is possible, like amoebas eating viruses from plentiful organics that evolved into bacteria. algae perhaps could grow on solid surface rocks, but surely not any multicellular beings on such a desolate moon. If life there evolved on its own, and didn’t arise from outer space contaminents, then earth life is threatened by these alien bugs. Perhaps one strain wins out on a planet, much like either gram negative or gram positive bacteria, and this dictates all life and evolution on a planet such as earth. PARTE 111.2 – The Parts of THE URANTIA BOOK – Revealing the Mysteries Of God, The Universe, Jesus, and Ourselves”. PARTE 111.3 – The Parts of THE URANTIA BOOK – Revealing the Mysteries Of God, The Universe, Jesus, and Ourselves”. Foreword. Deity and Divinity. Deity functions on personal, prepersonal, and superpersonal levels. Total Deity is functional on the following seven levels: 1. Static- self-contained and self-existent Deity. 2. Potential — self-willed and self-purposive Deity. 3. Associative – self-personalized and divinely fraternal Deity. 4. Creative – self-distributive and divinely revealed Deity. 5. Evolutional – self-expansive and creature-identified Deity. 6. Supreme – self-experiential and creature-Creator-unifying Deity. Deity functioning on the first creature-identificational level as time-space overcontrollers of the grand universe, sometimes designated the Supremacy of Deity. 7. Ultimate – self-projected and time-space-transcending Deity. Deity omnipotent, omniscient, and omnipresent. Deity functioning on the second level of unifying divinity expression as effective overcontrollers and absonite upholders of the master universe. As compared with the ministry of the Deities to the grand universe, this absonite function in the master universe is tantamount to universal overcontrol and supersustenance, sometimes called the Ultimacy of Deity. God. The First Source and Center. Universe Reality. Personality Realities. Energy and Pattern. The Supreme Being. God the Sevenfold. God the Ultimate. God the Absolute. The Three Absolutes. The Trinities. Paper 1. The Universal Father. 1. The Father’s Name. The Reality of God. God is a Universal Spirit. The Mystery of God. Personality of the Universal Father. Personality in the Universe. Spiritual Value of the Personality Concept. PARTE 111.4 – Paper 2. The Nature of God. 1. The Infinity of God. The Father’s Eternal Perfection. Justice and Righteousness. The Divine Mercy. The Love of God. The Goodness of God. Divine Truth and Beauty. Paper 3. The Attributes of God. God’s Everywhereness. God’s Infinite Power. God’s Universal Knowledge. God’s Limitlessness. The Father’s Supreme Rule. The Father’s Primacy. PARTE 111.5 – Paper 4. God’s Relation to the Universe. 1. The Universe Attitude of the Father. God and Nature. God’s Unchanging Character. The Realization of God. Erroneous Ideas of God. Paper 5. God’s Relation to the Individual. The Approach to God. The Presence of God. True Worship. God in Religion. The Consciousness of God. The God of Personality. Paper 6. The Eternal Son. Identity of the Eternal Son. Nature of the Eternal Son. Ministry of the Father’s Love. Attributes of the Eternal Son. Limitations of the Eternal Son. The Spirit Mind. Personality of the Eternal Son. Realization of the Eternal Son. Paper 7. Relation of the Eternal Son to the Universe. The Spirit-Gravity Circuit. The Administration of the Eternal Son. Relation of the Eternal Son to the Individual. The Divine Perfection Plans. The Spirit of Bestowal. The Paradise Sons of God. The Supreme Revelation of the Father. PARTE 111.6 – Paper 8. The Infinite Spirit. The God of Action. Nature of the Infinite Spirit. Relation of the Spirit to the Father and the Son. The Spirit of Divine Ministry. The Presence of God. Personality of the Infinite Spirit. Paper 9. Relation of the Infinite Spirit to the Universe. Attributes of the Third Source and Center. The Omnipresent Spirit. The Universal Manipulator. The Absolute Mind. The Ministry of Mind. The Mind-Gravity Circuit. Universe Reflectivity. Personalities of the Infinite Spirit. Subjective self-consciousness. Objective response to the Father’s personality circuit. The functional family of the Third Source and Center, as it is revealed in these narratives, falls into three great groups: I. The Supreme Spirits. A group of composite origin that embraces, among others, the following orders: 1. The Seven Master Spirits of Paradise. 2. The Reflective Spirits of the Superuniverses. 3. The Creative Spirits of the Local Universes. II. The Power Directors. A group of control creatures and agencies that function throughout all organized space. III. The Personalities of the Infinite Spirit. This designation does not necessarily imply that these beings are Third Source personalities though some of them are unique as will creatures. They are usually grouped in three major classifications: 1. The Higher Personalities of the Infinite Spirit. 2. The Messenger Hosts of Space. 3. The Ministering Spirits of Time. Paper 10. The Paradise Trinity. Self-Distribution of the First Source and Center. Deity Personalization. The Three Persons of Deity. The First Source and Center functions outside of Havona in the phenomenal universes as follows: 1. As creator, through the Creator Sons, his grandsons. 2. As controller, through the gravity center of Paradise. 3. As spirit, through the Eternal Son. 4. As mind, through the Conjoint Creator. 5. As a Father, he maintains parental contact with all creatures through his personality circuit. 6. As a person, he acts directly throughout creation by his exclusive fragments — in mortal man by the Thought Adjusters. 7. As total Deity, he functions only in the Paradise Trinity. The Trinity Union of Deity. Functions of the Trinity. The Stationary Sons of the Trinity. The Overcontrol of Supremacy. The Trinity Beyond the Finite. PARTE 111.7 – Paper 11. The Eternal Isle of Paradise. The Divine Residence. Nature of the Eternal Isle. The central Isle is geographically divided into three domains of activity: 1. Upper Paradise. 2. Peripheral Paradise. 3. Nether Paradise. Upper Paradise. Peripheral Paradise. Nether Paradise. Space Respiration. Space Functions of Paradise. Paradise Gravity. The Uniqueness of Paradise. Paper 12. The Universe of Universes. Space Levels of the Master Universe. Proceeding outward from Paradise through the horizontal extension of pervaded space, the master universe is existent in six concentric ellipses, the space levels encircling the central Isle: 1. The Central Universe — Havona. 2. The Seven Superuniverses. 3. The First Outer Space Level. 4. The Second Outer Space Level. 5. The Third Outer Space Level. 6. The Fourth and Outermost Space Level. The Domains of the Unqualified Absolute. Universal Gravity. Space and Motion. Space is, from the human viewpoint, nothing — negative; it exists only as related to something positive and nonspatial. Space is, however, real. It contains and conditions motion. It even moves. Space motions may be roughly classified as follows: 1. Primary motion — space respiration, the motion of space itself. 2. Secondary motion — the alternate directional swings of the successive space levels. 3. Relative motions — relative in the sense that they are not evaluated with Paradise as a base point. Primary and secondary motions are absolute, motion in relation to unmoving Paradise. 4. Compensatory or correlating movement designed to co-ordinate all other motions. Space and Time. Universal Overcontrol. The Part and the Whole. Matter, Mind, and Spirit. Personal Realities. Paper 13. The Sacred Spheres of Paradise. The Seven Sacred Worlds of the Father. Father-World Relationships. The Sacred Worlds of the Eternal Son. The Worlds of the Infinite Spirit. Paper 14. The Central and Divine Universe. The Paradise-Havona System. From the periphery of Paradise to the inner borders of the seven superuniverses there are the following seven space conditions and motions: 1. The quiescent midspace zones impinging on Paradise. 2. The clockwise processional of the three Paradise and the seven Havona circuits. 3. The semiquiet space zone separating the Havona circuits from the dark gravity bodies of the central universe. 4. The inner, counterclockwise-moving belt of the dark gravity bodies. 5. The second unique space zone dividing the two space paths of the dark gravity bodies. 6. The outer belt of dark gravity bodies, revolving clockwise around Paradise. 7. A third space zone — a semiquiet zone — separating the outer belt of dark gravity bodies from the innermost circuits of the seven superuniverses. Constitution of Havona. The Havona Worlds. Creatures of the Central Universe. There are seven basic forms of living things and beings on the Havona worlds, and each of these basic forms exists in three distinct phases. Each of these three phases is divided into seventy major divisions, and each major division is composed of one thousand minor divisions, with yet other subdivisions, and so on. These basic life groups might be classified as: 1. Material. 2. Morontial. 3. Spiritual. 4. Absonite. 5. Ultimate. 6. Coabsolute. 7. Absolute. Life in Havona. The Purpose of the Central Universe. PARTE 111.8 – Paper 15. The Seven Superuniverses. The Superuniverse Space Level. Organization of the Superuniverses. The Grand Universe. Seven superuniverses make up the present organized grand universe, consisting of approximately seven trillion inhabitable worlds plus the architectural spheres and the one billion inhabited spheres of Havona. The superuniverses are ruled and administered indirectly and reflectively from Paradise by the Seven Master Spirits. The billion worlds of Havona are directly administered by the Eternals of Days, one such Supreme Trinity Personality presiding over each of these perfect spheres. Excluding the Paradise-Havona spheres, the plan of universe organization provides for the following units: Superuniverses. . . . . . . . . . . . 7. Major sectors. . . . . . . . . . . . . 70. 7,000. Local universes . . . . . . . . . 700,000. Constellations . . . . . . . . .70,000,000. Local systems. . . . . . . . 7,000,000,000. Inhabitable planets . . 7,000,000,000,000. Each of the seven superuniverses is constituted, approximately, as follows: One system embraces, approximately. . . . . . . . . . . . . 1,000 worlds. One constellation (100 systems) . . . . . . . . . . . . . . .100,000 worlds. One universe (100 constellations) . . . . . . . . . . . 10,000,000 worlds. One minor sector (100 universes) . . . . . . . . . 1,000,000,000 worlds. One major sector (100 minor sectors) . . . . 100,000,000,000 worlds. One superuniverse (10 major sectors) . . .1,000,000,000,000 worlds. The Superuniverse of Orvonton. Nebulae — The Ancestors of Universes. The Origin of Space Bodies. The Spheres of Space. The Architectural Spheres. Energy Control and Regulation. Circuits of the Superuniverses. The Superuniverse Circuits: 1. The unifying intelligence circuit of one of the Seven Master Spirits of Paradise. Such a cosmic-mind circuit is limited to a single superuniverse. 2. The reflective-service circuit of the seven Reflective Spirits in each superuniverse. 3. The secret circuits of the Mystery Monitors, in some manner interassociated and routed by Divinington to the Universal Father on Paradise. 4. The circuit of the intercommunion of the Eternal Son with his Paradise Sons. 5. The flash presence of the Infinite Spirit. 6. The broadcasts of Paradise, the space reports of Havona. 7. The energy circuits of the power centers and the physical controllers. The Local Universe Circuits: 1. The bestowal spirit of the Paradise Sons, the Comforter of the bestowal worlds. The Spirit of Truth, the spirit of Michael on Urantia. 2. The circuit of the Divine Ministers, the local universe Mother Spirits, the Holy Spirit of your world. 3. The intelligence-ministry circuit of a local universe, including the diversely functioning presence of the adjutant mind-spirits. Rulers of the Superuniverses. Each superuniverse is presided over by three Ancients of Days, the joint chief executives of the supergovernment. In its executive branch the personnel of the superuniverse government consists of seven different groups: 1. Ancients of Days. 2. Perfectors of Wisdom. 3. Divine Counselors. 4. Universal Censors. 5. Mighty Messengers. 6. Those High in Authority. 7. Those without Name and Number. The Deliberative Assembly. The Supreme Tribunals. The Sector Governments. Purposes of the Seven Superuniverses. Master. Shop No. Uversa 5,342,482,337,666. Affiliated with the Grand Orient of Uversa jurisdiction over the Big East Seventh Super Universe Orvonton, linked to the United StarGate Universe of Universes of Time and Space (Paradise Island). Why am I reading this nonsense? Why isn’t this in the spam folder where it belongs? Sounds like it’s too early to rule out that a round trip to space is part of a microbe reproductive cycle, and the tiger stripes themselves could be living colonies. Is there not allot of radiation in this region around Saturn, if so would that not have an impact on possibility of life on one of it`s moons ? I tend to think it is unnecessary to protect the earth from contamination from other planets. There is surely material transfer between Earth and Mars, as we know of meteorites that have made it from Mars to Earth. Maybe some day we will find a chunk of Earth on Mars! But since there is this exchange, I think we can be sure that any life from Mars would not kill life on Earth, or it already would have done so. I believe the best bets for finding life in our solar system are to be found on Jupiter and Saturn—in their atmospheres and oceans. And please don’t tell me they have no oceans–I’ve researched the P/T phase diagrams to find that even for pure hydrogen scientists are not anywhere near sure of the phases, let alone the complex phases and compositions of planets such as these. And the quantity of water out there must be enormous–do you really think it’s all been converted to steam or converted to boiling metallic hydrogen? Ridiculous. That these misnamed “gas giants” are devoid of life is preposterous. Wake up people and use your logic and imagination—how could such huge, complex, and colorful planets be without atleast microbes–some thrown onto them from their moons no doubt(and vice-versa). And before you accept the barren gas giant model that seems to be the dogma nowadays, think of how life has altered the atmosphere, oceans, and even the geology of Earth. I like the idea of life on the moons too but it seems everyone has inexplicably dismissed the possibility of life on the “giants” proper. Why? I would also point out that floating planetary probes on Jupiter and Saturn would probably be a lot cheaper than ice drilling mission to their moons. I have much more to say on this but will wait for some feedback first. The question is: There´s water long enough in Enceladus to create and sustain life? It´s a 500km ball… there isn´t water to fill the atlantic ocean. My guess? We are living at the exact time where´s the ice in enceladus finally became water and started to flow. It will be over in a few million years!